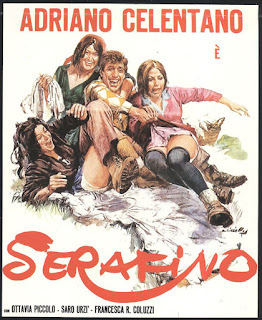 The director returns to a popular world in SERAFINO, which is 1966 won first prize (ex-aequo) at the Moscow Film Festival. On a script written by Giovannetti, Benvenuti, De Bernardi and Pinelli, Germi tells a story about a small Ciociaro town of farmers and shepherds, cut off from the modern world. Most of all it is the portrait of Serafino, a country yokel, lumpish and uncouth but good at heart and very asute, who manages to extricate himself, amidst swindlers and swellheads, and to get along with unruffled serenity, veritable symbol of the pure, unspoiled popular soul. By no accident, of the people around him the only figure who is to a certain extent lovable and positive is Asmara, a young village prostitute, the mother of countless children (excellently portrayed by Francesca Romana Coluzzi). Of particular interest the dialogue, where for the first time slighting "bawdy" verbal expressions are used, typical of the way a peasant would speak. The film launched the acting career of a pop singer, Adriano Celetano, who will be further discussed in the last chapter, revealing in him outstanding qualities as a spontaneous and appealing actor. At the time of his death, Germi was preparing AMICI MIEI (MY FRIENDS: 1975), which was then directed by Mario Monicelli with the utmost respect for the intentions and desires of the late director, so that while Monicelli appeared in the credit titles as the director, a notice was added with the words: "a film by Pietro Germi". After Sicily, the Veneto and Lazio, now it was Tuscany which, from the time of Giovanni Boccaccio's classic novelle, has been the land of the practical joke, the sarcastic jibe, the sometimes even cruel prank. Five fifty-year old friends, distinguished professionals in life, are used to getting together from time to time to play sensational jokes in the most unimaginable places, often devised, planned, and carried out on a large scale. Life, however, cannot be brought to a halt byt his childish way of staying twenty when you are more than twice the age, and the death of one of them would end by giving them a glimpse of the bitter fact that the days of games and horseplay are over. Whimsical, bizarre, jocose, interrupted by frequent thrusts of grief and drama, AMICI MIEI (MY FRIENDS) blends the finest qualities of Germi and Monicelli in a satirical representation of penetrating depth. The five friends are Tognazzi, Philippe Noiret, Gastone Moschin, Adolfo Celi and Duilio Del Prete, while Bernard Blier plays the part of Righi, their chosen victim.